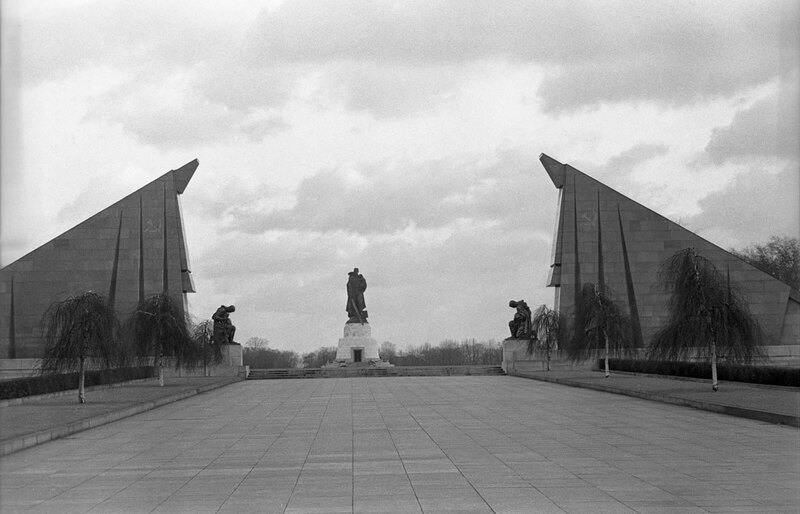 The Russian War Memorial Monument in East Berlin. It is on a fittingly overcast winter day, somewhat after a snowfall. The trees still have wispy threads of ice and snow. I understand the monument no longer exists. If so, that is a shame. It is a dreary, example of Russian post-war monumental architecture and sculpture. But it is somehow fitting, oppressive, and true and rubbed the Germans' noses in their WW2 deeds and the Russian sorrows they caused. Evidently so much so that the Germans hated it and got rid of it....though I hope not.